Now, I’ve said before that one of the most important things about The Muppet Show is that its success isn’t reliant on the human celebrity, and that remains true. There’s a reason that, unlike other variety shows such as SNL, they are specifically referred to as “guests” rather than “hosts,” and that is to establish right off the bat that they are supporting the Muppets, not the other way around (the flip side is one of the reasons some post-Jim productions such as The Muppet Christmas Carol and Muppet Treasure Island have faced some criticism). Practically every episode of The Muppet Show has at least a few great and/or classic moments regardless of the guest star. However, a weak guest and/or a guest not used well can undermine the structure of an episode, making it feel more like a mixed bag collection of moments rather than a solid whole. Luckily, Duncan’s high-energy vibe and sweet nature are a joyful, perfect match for the Muppets, which helps the whole thing feel more cohesive, and that’s then further solidified by the aforementioned “plot”. Again, it’s a fairly simple one: a newly confident Fozzie takes to the stage early on in the episode and not only doesn’t let Statler and Waldorf get to him but absolutely kills, provoking an uproarious response in the audience unlike he has ever commanded in the past. Upon returning backstage, he explains to Kermit that he has a new comedy writer, “the legendary Gags Beasley,” someone who Kermit has never heard of before but who, in the world of the Muppets, is apparently a comedy giant (Hilda describes him as being “what Mozart was to music”! ), largely thanks to his “famous banana sketch,” which is specifically what slayed Fozzie’s audience earlier. Kermit asks what the banana sketch is, and everyone responds in shock. How could Kermit–of all frogs–have never heard of the banana sketch before?! One by one, over the course of the episode, characters such as Fozzie, Scooter, Hilda, Gonzo, Piggy, and even Duncan herself can barely process this. 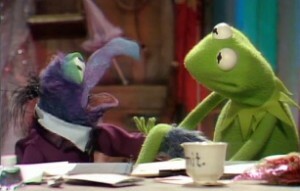 Gonzo can’t believe that Kermit doesn’t know the famous banana sketch! Although no one has the exact same reaction to it, most end up in laughter of some sort, either over the simple fact that Kermit is so ignorant about this one clearly key piece of entertainment knowledge or because just thinking of the banana sketch makes them lose control of themselves. The best example of this is in the Talk Spot, which starts off just between Kermit and Duncan, as per the norm, but then is “intruded” upon by Fozzie, who begins a conversation with Duncan about Gags Beasley that leads to Fozzie and her collapsing into utter hysterics, which gets even worse when she desperately tries to explain the sketch to Kermit but can’t even get the words out because she’s laughing too hard, which subsequently makes her laugh even harder. Naturally, as the episode goes on, Kermit grows more and more frustrated about this, completely losing his froggy cool, as he goes from feeling left out to stubbornly refusing to believe the sketch even exists (they must all be pulling his leg!) to finally surrendering to the fact that he’s just never going to be in on this particular joke. There are just so many great things about this entire conceit. Firstly, whether or not it was intentional, Fozzie going from Bruce Forsyth helping him succeed against Statler and Waldorf’s taunts in the previous episode to another total comedy triumph on-stage in this one creates a wonderful arc and sense of forward momentum for his character. Our lovable bear feels like he’s finally starting to come into his own, gaining in confidence if not actually in talent. Secondly, that is further cemented by him actually being in on something that Kermit isn’t, a fabulous turning-of-the-tables the sort of which is where great comedy comes from, flipping our expectations on their heads. In most cases when Kermit loses his temper, it’s because everyone around him is behaving chaotically/erratically and so we’re generally on his side. The special magic of this situation is that–even though we as viewers are never privy to the banana sketch either–just the fact that we are being constantly reassured by everyone else that it is actually that funny and that it is incredibly strange that Kermit doesn’t know it basically fools us into agreeing with them, particularly when Duncan reveals herself to also be a big fan of the banana sketch, too. The human knowing it too gives it a sense of legitimacy that keys us into it not just being a case of all of the Muppets but Kermit being crazy. And the particular scene in which Duncan demonstrates her knowledge is one of the best examples up to this point of a human guest being entirely complicit in the Muppets’ reality. Duncan’s hysterics with Fozzie seem so natural and real that it never feels anything less than two actual friends sharing an in-joke. And that laughter is so infectious that we can’t help but laugh uproariously along with them, with Kermit’s exhausted bemusement providing the icing on the comedy cake. Duncan can’t believe Kermit doesn’t know the famous banana sketch. But what ultimately makes Kermit, Kermit is that he isn’t a mean or spiteful character. Upon realizing that no one is ever going to be able to adequately explain the banana sketch and why it is so funny to him, by the end of the episode, he just graciously gives up, having Fozzie present Duncan with a lovely bouquet of bananas to signify that there are no hard feelings, and revealing that he does indeed have a sense of humor about himself, which is just lovely. We see the full gamut of Kermit’s more extreme emotions here–his sometimes short temper balanced with his genuinely good-natured kindness. I’d also just like to make note of the fact that this isn’t the only first season episode that revolves around a single joke to which we as viewers and some of the characters aren’t privy. In many ways, it’s reminiscent of the Paul Williams episode, in which Scooter convinces a reluctant Fozzie to do the “telephone pole bit”. The banana sketch is superior for multiple reasons. The most important is that we never see the banana sketch. The writers wisely realize that they’ve deliberately built it up so high in people’s minds that nothing could actually live up to it. The second you present a real joke, it creates the problem that many people won’t find it as funny as they’re meant to, and this solves that issue.